Iowans voted to keep two long-term Democratic incumbents as state treasurer and attorney general, but Iowa’s Democratic secretary of state narrowly lost to a Republican challenger from western Iowa. Council Bluffs City Councilman Matt Schultz defeated Secretary of State Michael Mauro’s bid for a second term as the state’s commissioner of elections. The margin of victory in the race is less than 30,000 votes out of the more than one million votes cast. Democrat Tom Miller, the seven-term incumbent attorney general, beat his Republican challenger by 10 points. Republican Brenna Findley left her job as Congressman Steve King’s chief of staff and raised over a million dollars for her race against Miller. State Treasurer Michael Fitzgerald, a Democrat, won an eighth term, defeating Republican challenger Dave Jamison by nearly six points. Two Republicans who hold statewide office were reelected Tuesday. State Auditor Dave Vaudt won by 13 points. 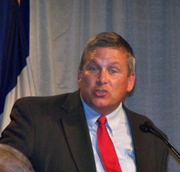 Ag Secretary Bill Northey talks to supporters after winning his second term.